This is another great intro-to-money book. It’s part of Stuart’s MathStart series, which includes 62 other books — he has written around 80 books in total. 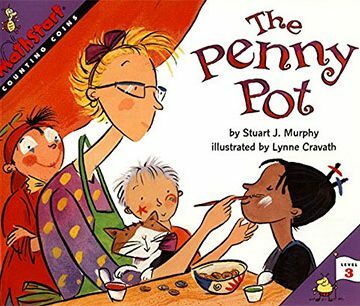 The Penny Pot is a children’s storybook and a math schoolbook in one. Your kids will love the story and I bet they’ll be interested to learn about all of the money in the book. The Penny Pot is suggested for kids 6-10 years old, so it’s great to introduce after Alexander, Who Used to Be Rich Last Sunday. Kids will start learning the different denominations of money, as well as some great lessons in spending.